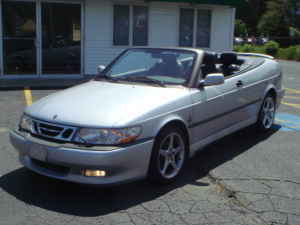 2000 Saab Viggen Convertible - Saab has a history of making some pretty exciting cars in very limited numbers. They also have a history of not publicizing these cars very well. This is one of those cars. The Saab 9-3 Viggen was developed jointly by Saab's Special Vehicles Operations team and the England-based TWR Group (of Jaguar and Aston Martin fame). The car is named after one of Saab's fighter jets. Viggen means "thunder bolt" in Swedish and it's an appropriate name. 60 seconds comes in 6 seconds and the cars top speed is over 150 MPH. Saab made just 2000 Viggens. Although it has a TWR designed bodykit and front spoiler, it doesn't look a whole lot different from a standard 9-3. That's part of it's charm. To most people you'll appear to be driving a sensible car, which, being a Saab, it is. It just happens to be a sensible car that can run with a BMW 3 Series or Audi A4. Located in Weymouth, MA, click here to see the Craigslist listing for this Saab. 1995 Land Rover Range Rover County SWB - This post is for me. I've been looking at these a lot lately. It just seems like the type of vehicle I should have as my winter beater. The big problem is that most of the available older Range Rovers I've seen are just plain beat. Either a lack of maintenance or some serious off-roading have made good, solid classic Range Rovers hard to find. This Range Rover County is one of the nicest I've seen in a long time. 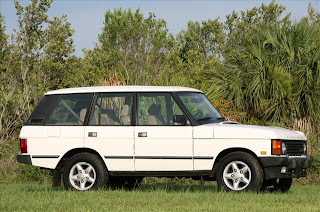 1995 is the last year of the "classic" Range Rover and the year to have. The dash design is more modern and Land Rover worked out many of the "bugs" found in older models. This Range Rover is located in Tampa, FL. According to the seller it "has never been driven in inclement weather". (Why have a Range Rover, then? But that's an argument for another day...) Click here to see the eBay listing. 1985 Jeep Cherokee Wagoneer Diesel - Back when Jeep Cherokees were my winter beaters of choice, I would spend time on some of the Cherokee websites and forums. To a small group of Cherokee fans a diesel Cherokee was the Holy Grail. They're tough to find. Besides being a diesel, this Cherokee is rare for another reason... It appears to be rust free. I could never kill my Cherokees. They ran forever. They killed themselves with rust, though. This one is one of the cleanest old Cherokees I've ever seen. Technically, this vehicle is called a Wagoneer. That's what it's titled as. In reality they were Cherokees with quad headlamps (after 1985), a different grill, a plush interior and fake woodgrain on the side. A number of years ago I had a 1987 Wagoneer (with the unburstable 4.0 liter 6). It was a great vehicle. Someone stole it. I'm still pissed about that. Click here to see the listing for this 1985 diesel powered Jeep Wagoneer.